Other people can be given The sky of Montserrat. A stroll through the abbey, a nocturnal observation of a celestial body for millions of kilometres, a meal worthy of an Abbot, an excursion to Sant Jeroni or enter in the world of sports climbing, these are the activities that you can enjoy in this wonderful Natural and spiritual space that is Montserrat. They will enjoy an exemplary dinner and a nocturnal observation by Joan Anton Català, astronomer and scientific disseminator, accompanied by a full explanation on the celestial body to be observed and an introduction to practical astronomy. Once rested in the hostel Abat Cisneros and with the stomach full of breakfast, they can choose different activities that are done in Montserrat, all with exclusive discount. 11.00 a.m. Varied activities with a discount of 10% [Book activities at the reception on the same Saturday or Sunday]. Dinner, bed and breakfast at the Hostal Abat Cisneros. Consult the supplement for single room. 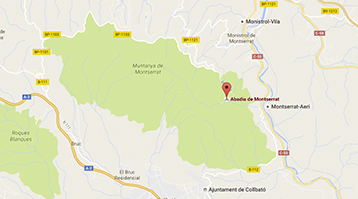 To attend the activity of the Sky of Montserrat, we will have to make the reservation and the payment. At the moment of making the reservation you will have to choose the activity, the menu and specify if you have any food intolerance. Persons with disabilities: please check the accessibility of the spaces before making the reservation, through the telephone or email indicated. They can give to others people the activity of the Sky of Montserrat. The gifts can choose the day that they prefer to enjoy the experience within the dates of the activity. You can buy the gift voucher by phone at 93 327 01 25 (from 9 a.m. to 9 p.m. from Monday to Friday) or 697 864 262 (Saturdays and holidays from 10 a.m. to 2 p.m.) indicating the details of the person who buys the check and the name and The surnames of the attendees who will receive the gift.